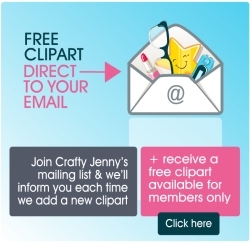 Welcome to Crafty Jenny's clip art page. Here you can download royalty-free images from Crafty Jenny's original clip art collection - FOR FREE! We will be adding new designs regularly. If you would like to be notified each time we add a new image, you can Join our mailing list here. Click on an image to proceed to download.